Three New Profit portfolio organizations—two current and one past—are participants in the 2014 Skoll Social Entrepreneurs Challenge. As part of a crowdfunding effort, the Skoll Foundation is contributing up to $2M to the participating organizations - for every $500,000 that the crowdfunding community raises, Skoll will contribute $250,000. Says Skoll, "The ten teams that raise the most during the Challenge win grand prizes and there will be weekly Bonus Challenges where organizations can win additional prizes. And, the best part of the Challenge is that even if you don't win any of the grand prize money, you get to keep the money you raise during the campaign." 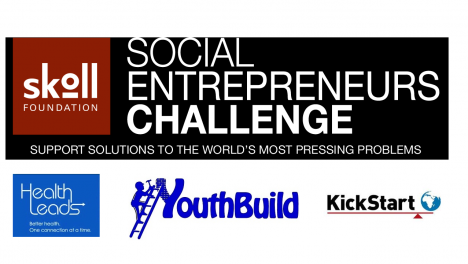 New Profit portfolio organizations Health Leads and YouthBuild USA, as well as one of our past portfolio organization KickStart, are taking part in the Challenge, which runs through December 5th. To help their efforts, click on the links above. To see all organizations in the Challenge and to learn more about it, click here.